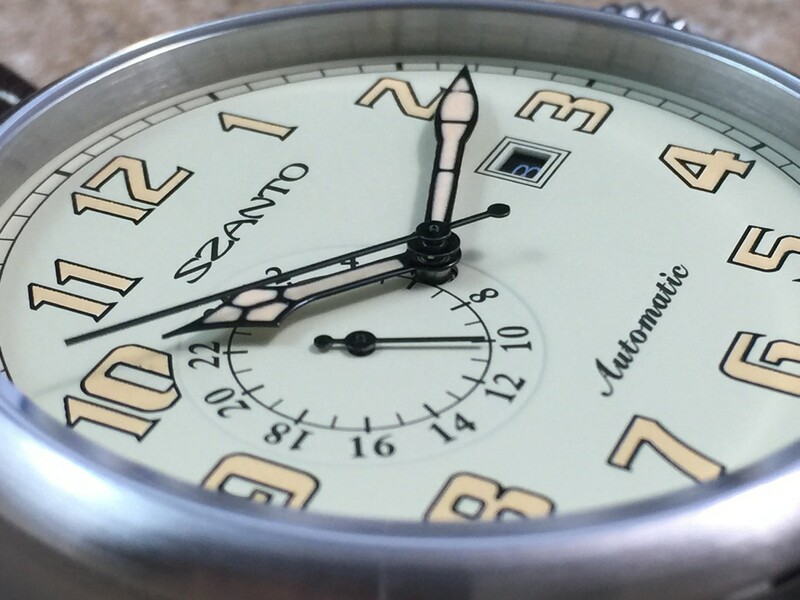 Once again I am thrilled to share my thoughts about a watch model from SZANTO Watches. 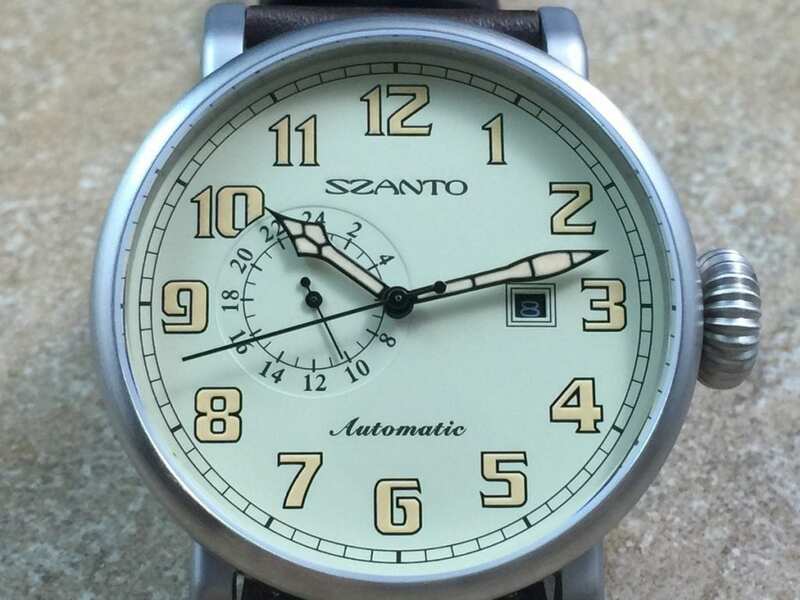 A year or so ago, when I first had the opportunity to review a SZANTO watch, I was really unsure of what to expect when the watch arrived. 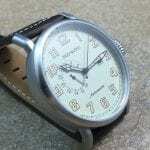 Through various conversations with the company, the fashion watch concept was stressed by the marketing representative. 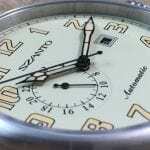 What is the first idea that pops into your head regarding “fashion watches”? In regard to watches, I know for me and almost every colleague of mine, the “fashion” label has strong connotations for lack of quality. 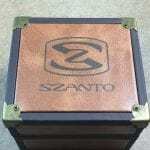 Based on what I have personally inspected from SZANTO, the quality of the product has never been an issue. 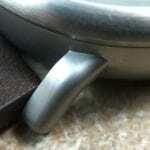 The watch case is composed of stainless steel with brushed and blasted finishing. 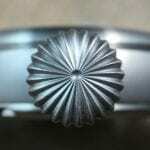 The case measures 46mm in diameter and nearly 51mm including the crown. The lug tip to lug tip measurement is fairly massive at 54mm. 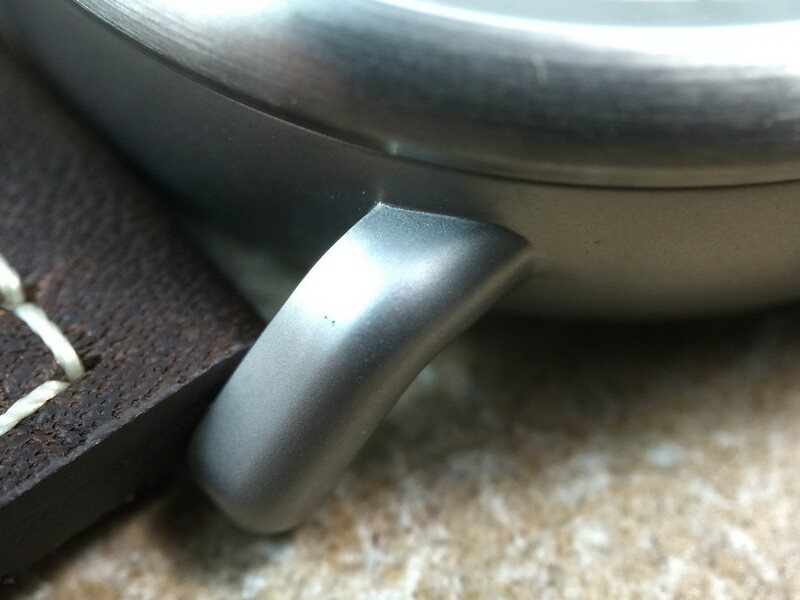 Even with some whopping case measurements, the model is just under 13mm thin which should slide nicely under a dress shirt cuff if necessary. Even though the watch only weighs 103 grams, the other specifications will lead to quite a substantial appearance on the wrist. 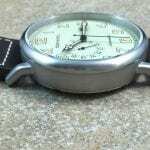 The weight, however, will keep the watch from feeling cumbersome on the wrist. With an over-sized watch, an over-sized crown shouldn’t be a surprise. 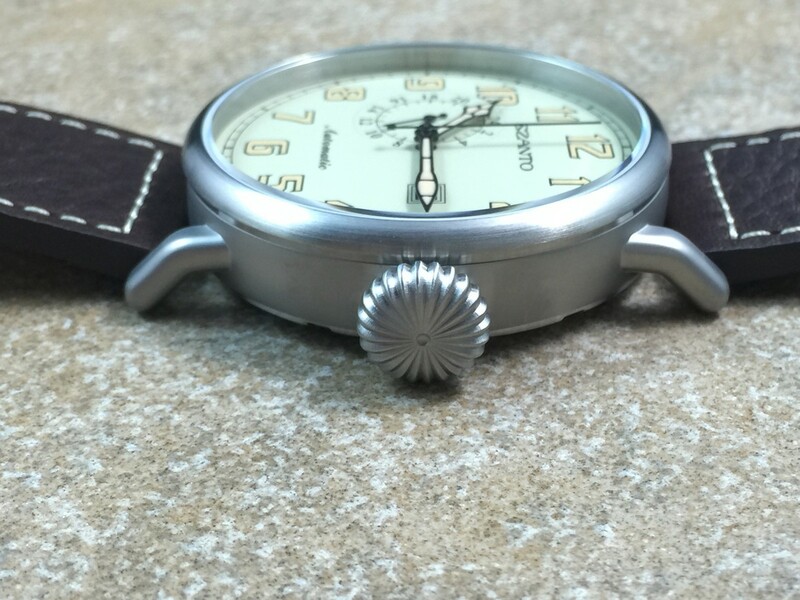 The Aviator comes with a massive 11mm “onion” style push pull crown located on the 3 o’clock side of the case. Since the crown is quite large, it is extremely easy to grasp and engage. 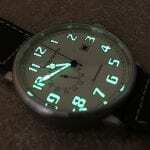 Remember when I alluded to earlier that fashion watches can have suspect quality? 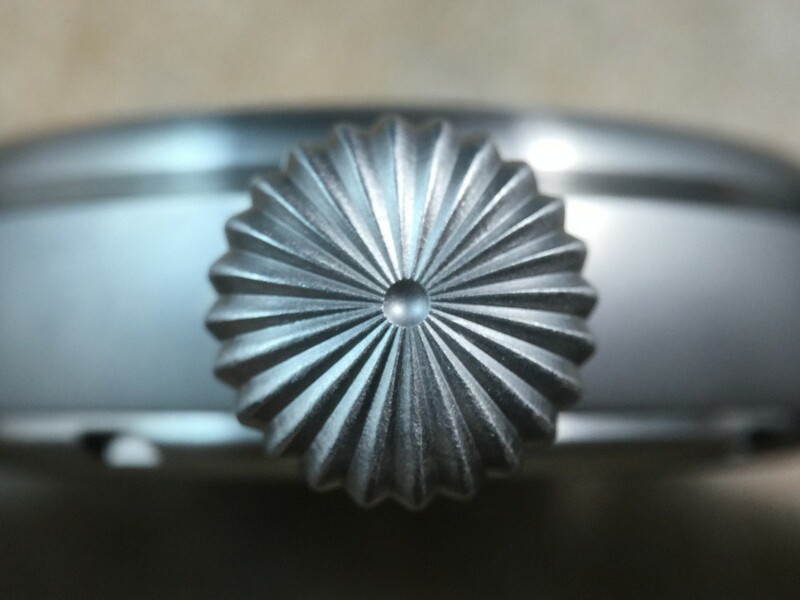 Typically, based on my past experience, I have found many fashion watch crowns to have quite a bit of play or wiggle when engaged, but I can report the crown on this particular example is quite firm with absolutely zero play. The SZANTO Aviator is fitted with a flat K1 hardened mineral crystal. The crystal is over-sized just like the watch, measuring 41mm in diameter, which provides a great view of a rather vintage style dial. 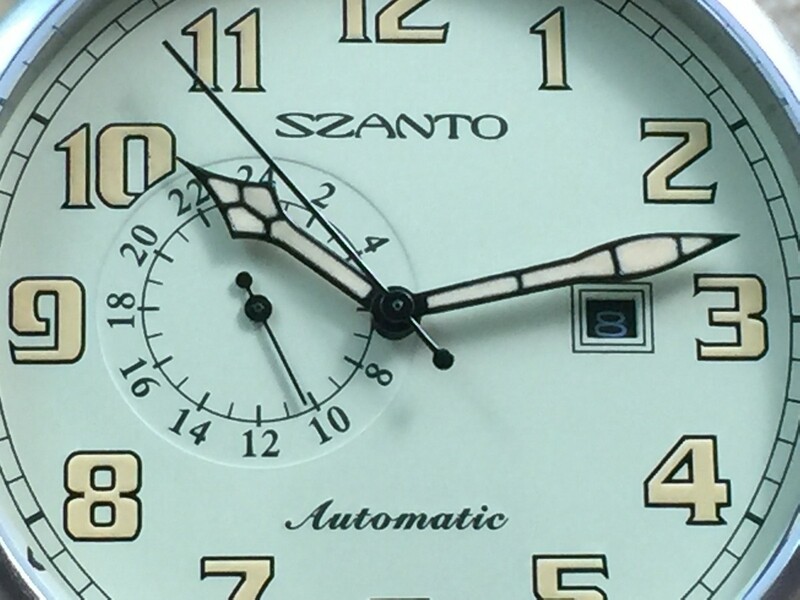 I am quite happy that with such a large dial that SZANTO didn’t clutter it up. 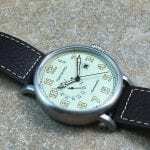 I have seen far too many large dials, just because so much surface area is available, a watch company will try to cram in a bunch of complications or writing. 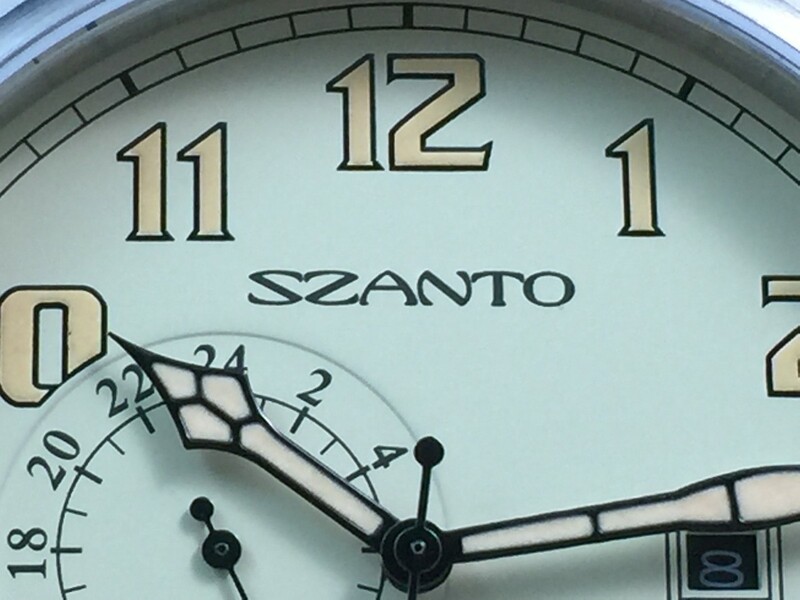 Two thumbs up to SZANTO keeping it clean with the limited branding above and below center dial. I really like the cream colored dial combined with the vintage colored lume applied on the Arabic hour markers and on the handset as each compliment the other quite nicely. 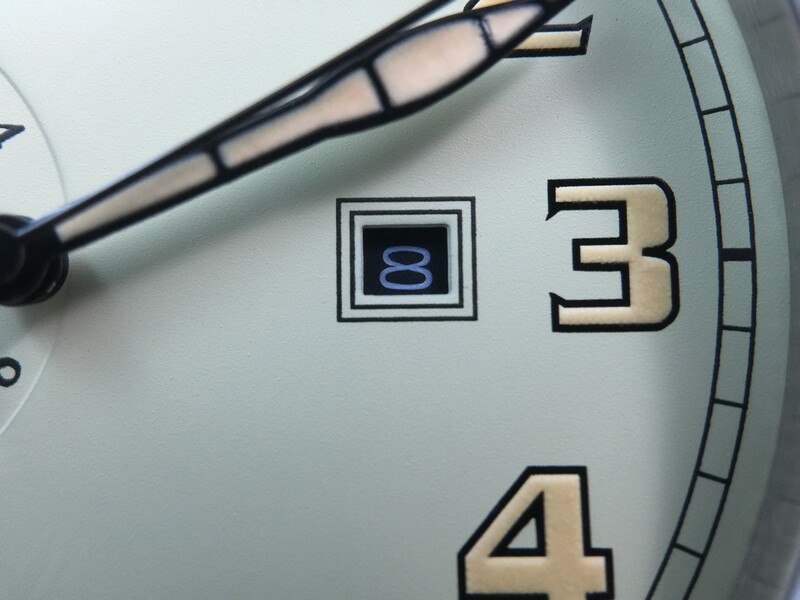 The Aviator has two complications, the date window located at the 3 o’clock position on the dial and a 24 hour indicator at the 9 o’clock position on the dial. The vintage superluminova “radium” on the markers and the handset is quite intense on initial charge but as with most vintage lume fades fairly quick. The afterglow does last for a few hours, so telling time in a dark movie theater or the like shouldn’t be much of a problem inside of a couple of hours. 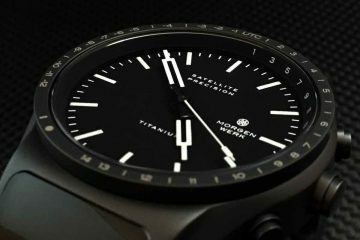 Overall, I think the dial will most certainly catch the eye and create quite a bit of conversation as it provides a significant amount of aesthetic appeal. I still prefer a sapphire crystal to mineral every day of the week. The case back is screwed down to the upper part of the case. 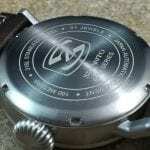 The case back has general specification information etched around the perimeter about the watch model. 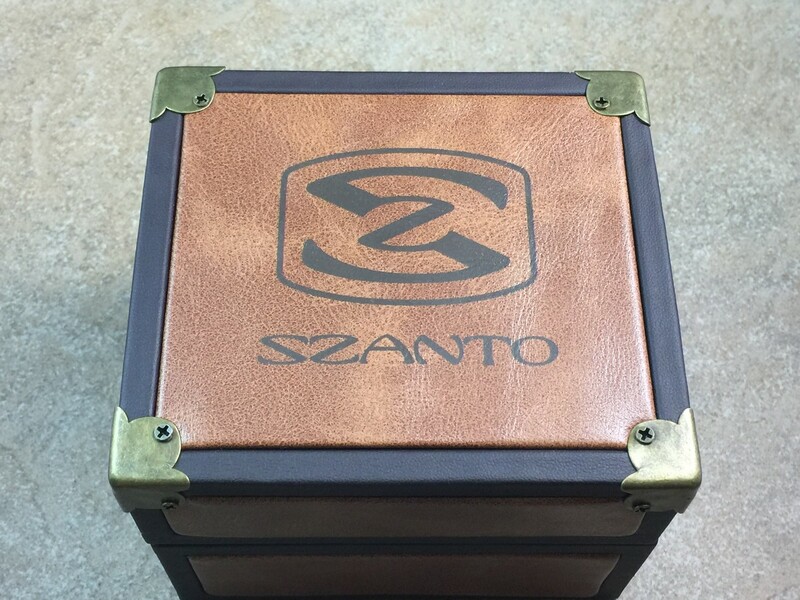 The SZANTO logo and branding is etched at the center. 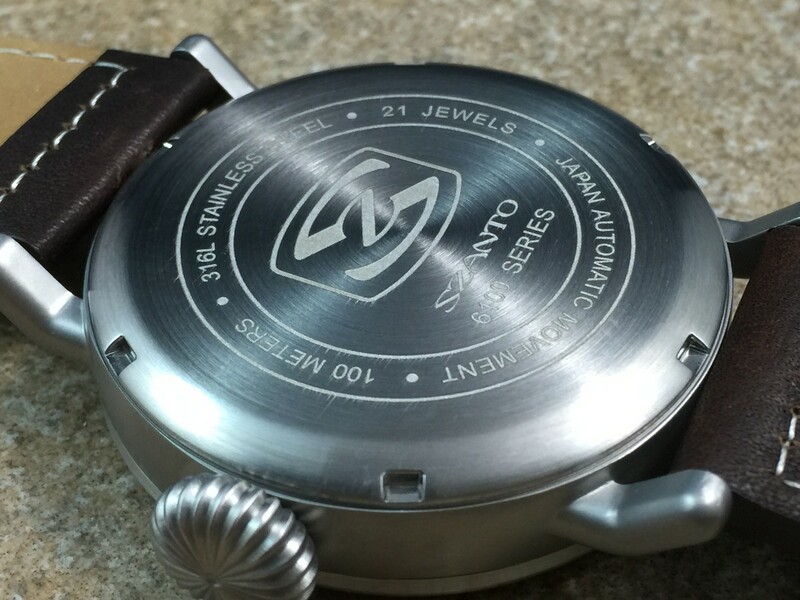 Beneath the case back is a reliable 21 jewel Miyota Automatic 8217 movement. The 8217 provides the 24 hour complication and is slightly more decorated than a Miyota 8215. 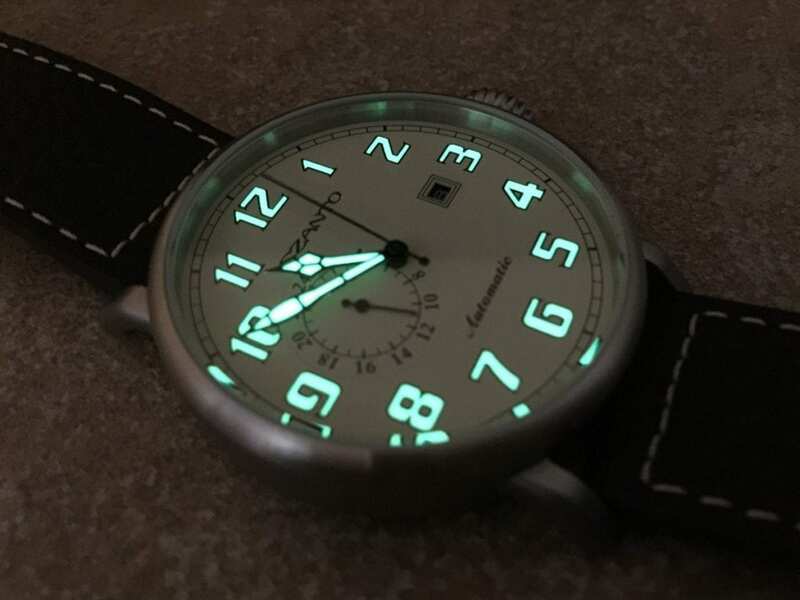 I have to admit, since the model is only 100 meters water resistant and the movement is slightly decorated, a display crystal would have been a great addition to the watch. My only gripe with the 8217 is the lack of a hacking feature and the sweep second hand can be fairly choppy similar to the 8215. The movement has been fairly accurate as one would expect from a 21 jewel Miyota automatic at around +20 seconds a day. 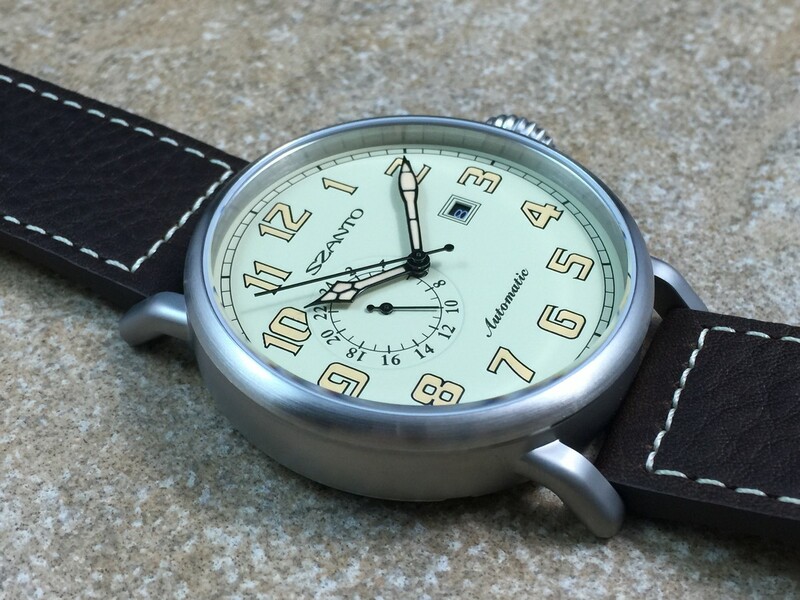 I know SZANTO wants to keep costs down while providing a quality timepiece to consumers, however, I would enjoy seeing the company use some higher grade Miyota automatic movements. A 9100 series Miyota in this particular model would have been a home run in my opinion. 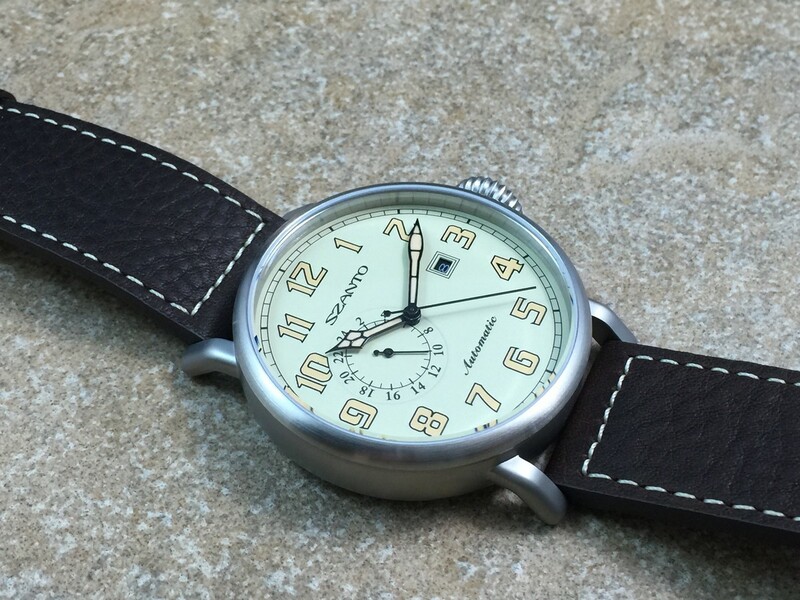 Finishing off the SZANTO Aviator is an incredible brown calf leather strap. 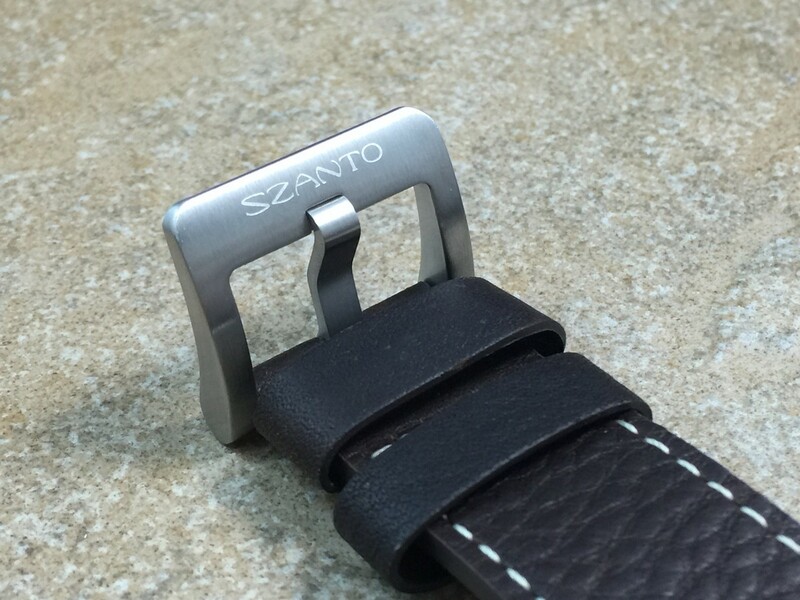 Every strap I have seen on a SZANTO watch has been of high quality and never disappoints. 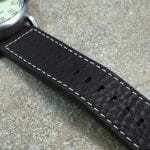 The strap is another area “fashion” watches typically fail miserably but not SZANTO. 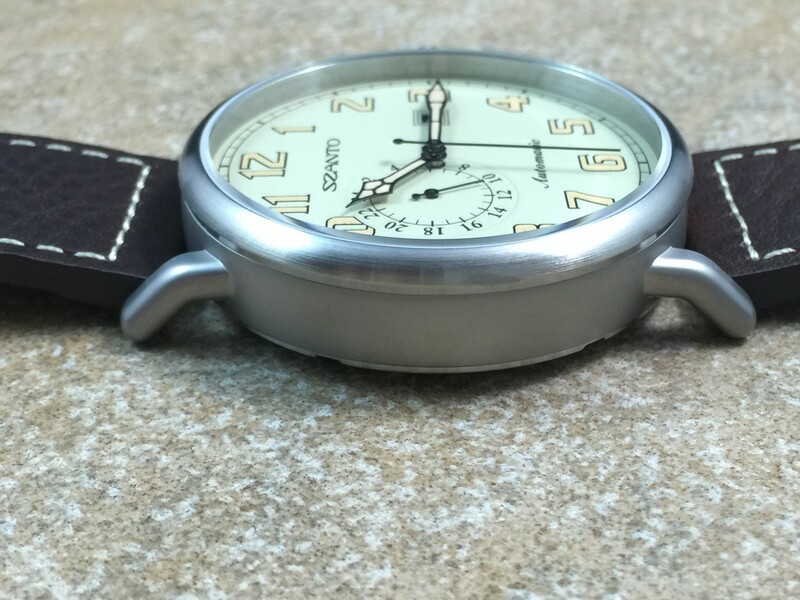 Obviously, the company understands that comfort plays a huge role toward exactly how much wrist time a consumer will allot to their product, so the straps they provide are far from just an afterthought. 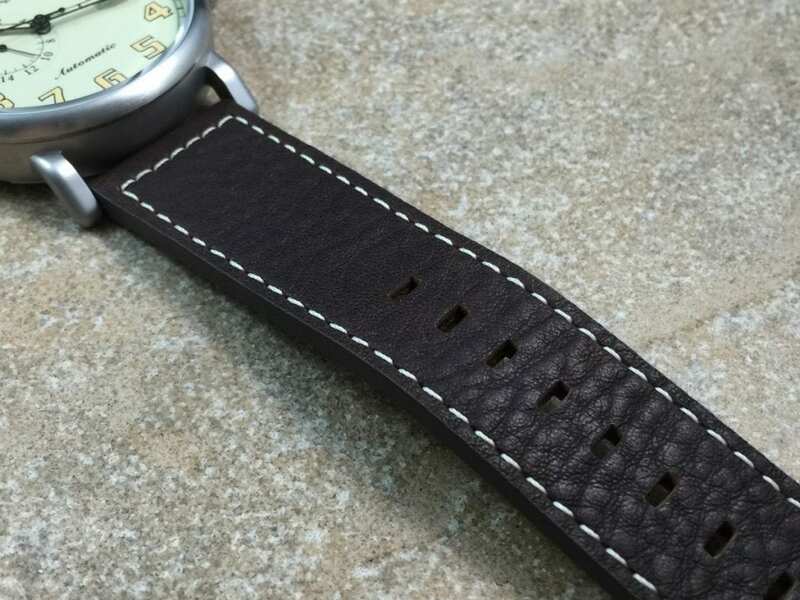 The calf leather strap provided is quite soft and supple and is extremely comfortable on the wrist. 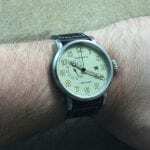 Also, as you will notice in the photographs and my video on my 7 ¾ inch wrist, the strap is constructed with quite a number of sizing holes that will allow fitting on wrists over 8 inches in size. The strap is slightly over 3mm thick and measures 24mm at the lug tapering to 22mm at the tail. 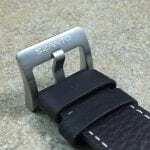 The strap comes with two keepers, one fixed and one floating, which are necessary for any good leather strap. The strap is finished off with a heavy duty signed buckle. The only aspect of the strap that bothers me is the taper. 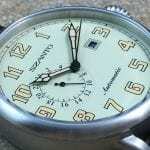 I wish all watch companies would eliminate the taper period. 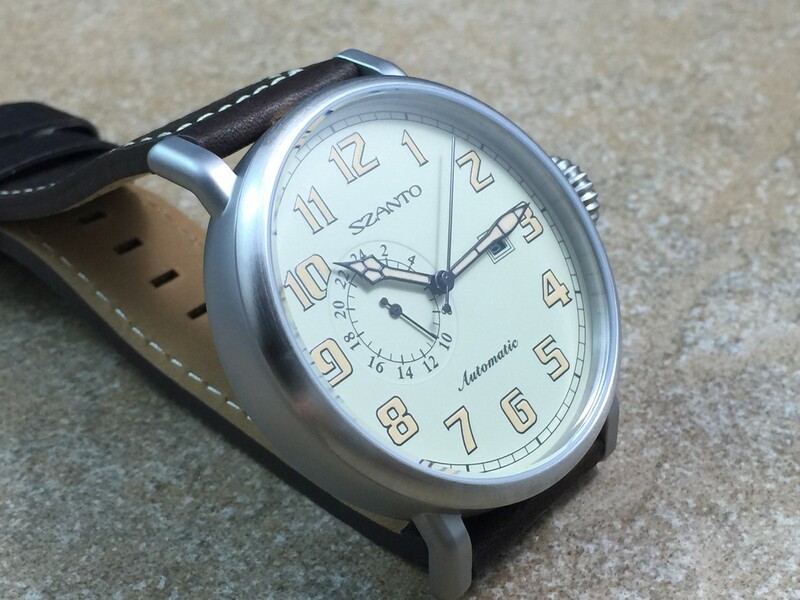 Overall, the Aviator strap is great looking, high quality, and comfortable so another two thumbs up for SZANTO. 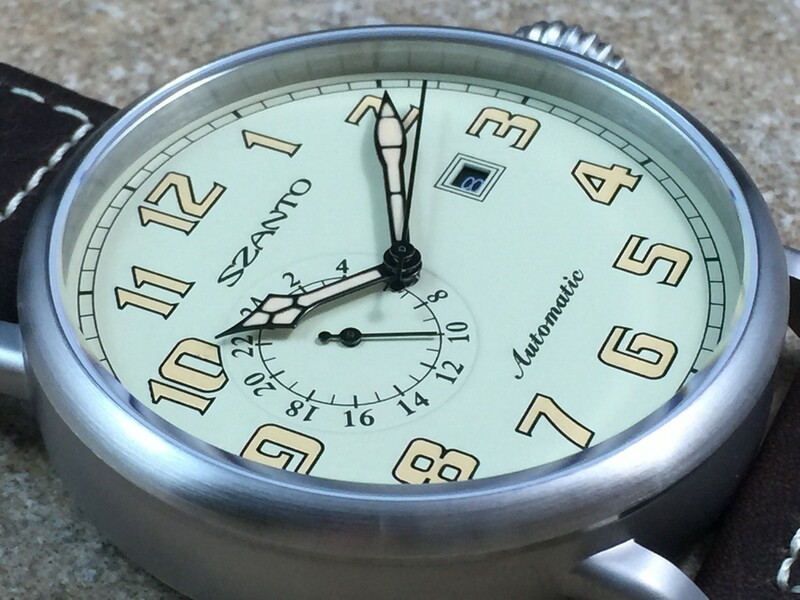 In summary, the Aviator Series from SZANTO Watches is going to provide quite a bit of quality and presence for consumers seeking an over-sized pilot watch. 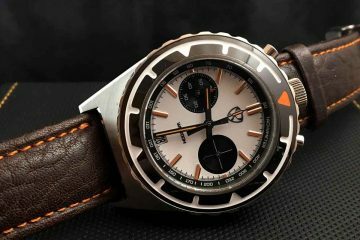 While far from perfect, the Aviator comes with some nice specifications including a Miyota automatic movement, great design, aesthetic appeal, and a fantastic strap far exceeding many well known fashion watches on the market. Upgrade the crystal to sapphire and switch from the 8217 Miyota to a 9100 series option and the $450 retail price would be much more palatable in my opinion. While not totally out of line at the current retail of $450, many watch fanatics will clamor for the upgrades I have mentioned above. 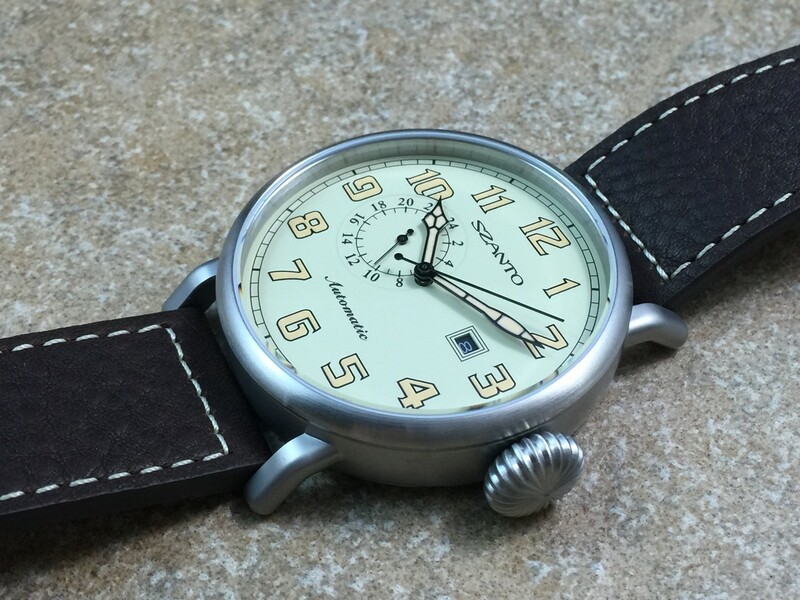 Regardless, the Aviator is a quite striking looking pilot style watch and I give SZANTO two thumbs up for producing a quality fashion pilot style watch. 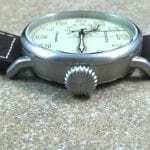 I would like to thank SZANTO for working with WatchReport.com on this review. 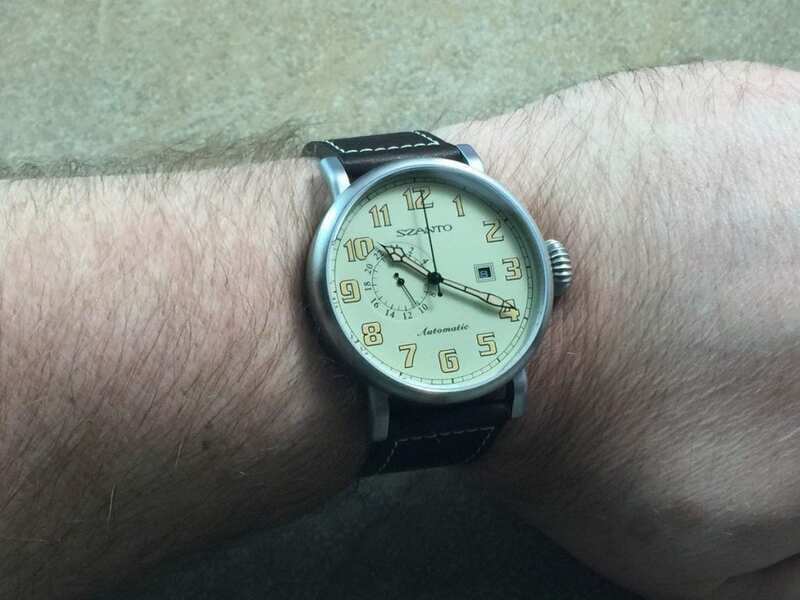 I would like to thank each of you for reading and ask that you take a moment to view the brief video presentation included with the review and subscribe to the WatchReport.com YouTube channel. I look forward to your thoughts and comments, as always. 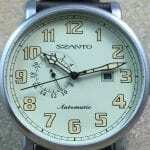 A warning about Szanto watches: Their customer service, reliability and repairs are very poor. 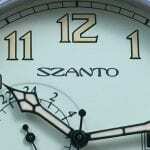 I bought the Szanto #2001 watch and within 3 months became frustrated that it never kept accurate time. Lost several minutes everyday or frequently stopped altogether, but was erratic. 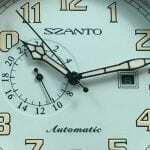 Szanto customer service offered no apology when I inquired about warranty repair. They replied this model was several years old and the battery was probably dead, or if the tab under the crown was intact it was a “storage issue”. The brand is only a few years old, yet they suggested the possibility parts are no longer available. 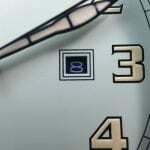 I then noticed the second hand of the tiny dial was getting stuck on the hour hand. I wrote back with this discovery about the poor quality control. No apology again, just a statement they have sold hundreds of watches and it was just a problem with my watch. Absolutely not what you want from a brand new watch or new watch company. 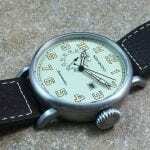 I sent the watch in to their repair service, Saltzman Watches, and received confirmation and notice it would be processed in 2-3 weeks. Now 4 weeks later, I inquired about the status and was told they needed to wait for the movement to arrive and the watchmaker now has it. 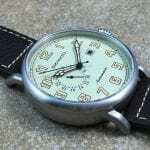 However, no ETA given for actual repair or when the watch will ship back to me. 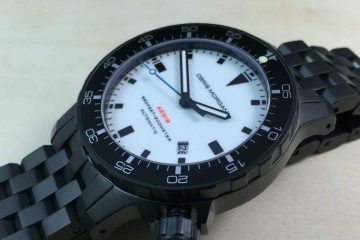 These watches look nice, but are a crap shoot for quality. The company couldn’t care less about reliability and has apathy for making repairs. Please don’t recommend them to anyone. Thanks for the report on Szanto’s poor service. I have changed my mine and will go to another brand where the company takes pride in their product and service. Here’s a follow up… The watch was returned to me after 6 weeks without any repair. It was still broken with exactly the same problem, as if they never looked at it. I complained again to Szanto, even requested an exchange, but the company rep ignored it and required I send it back to Saltzman for repair again. Again, I included pictures and a description of the exact problem with the hands touching. Once again, it took longer than 2-3 weeks. This time it was returned with the same problem, but the hands touched in a different location. I have never experienced such incompentence or apathy. The purchase was a complete waste of my money and the warranty was a conplete waste of time.